Emily had a crash on her bicycle this afternoon that resulted in a couple of large gashes in her knee. I wrapped it the best I could and headed to the after hours clinic where April works. She was working tonight and got us right in. Emily ended up getting about four stitches in one gash and they glued the other together. I don’t remember that being an option when I was a kid! They also used some “magic princess jelly” to numb the wounds before doing anything to them. What happened to the gouging needle to numb the cut? I’m actually very glad that Emily didn’t have to go through all that. It was really neat to see April in action at work. I’m so proud of her not only as a mother and wife, but as a nurse. She is really good at what she does and works very hard. I couldn’t ask for a better woman to be my wife and the mother of my children. Well, another day and another adventure. I guess it’s par for the course when you have kids!! I just finished playing a Strawberry Shortcake board game with the kids. I am amazed by how much noise comes out of their mouths 24/7! I recorded a clip of the chatter that goes on during a game like this. If you don’t have young children, this might be the best form of birth control…. We had a great time at the Birmingham Baron’s game last night. I was worried about the girls being able to see, and they did struggle where we sat at first (upper section along the first base line). The kids wanted to bounce on the inflatables in the park (an outrageous extra $15). 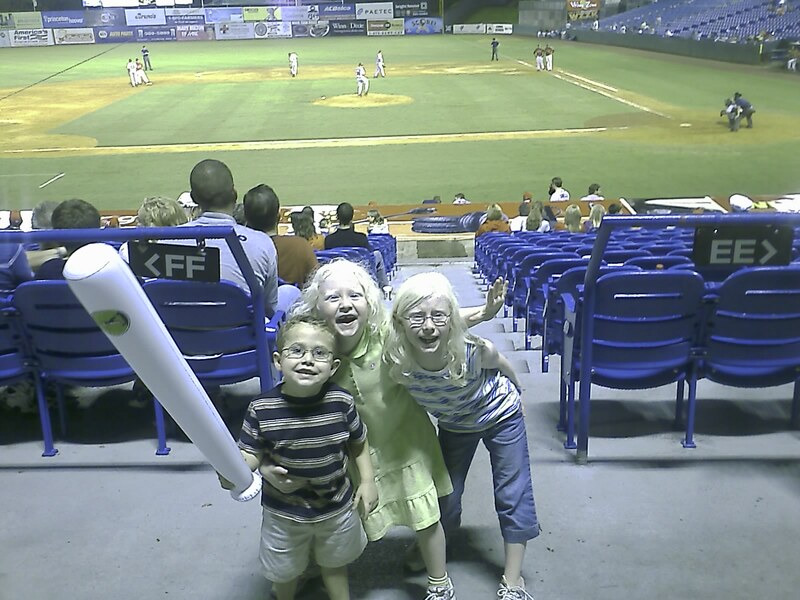 They played a few innings on the inflatables and then we pulled them off to get some ice cream. We found some seats closer to the field on the third base line and enjoyed our ice cream. That’s when the girls really got into the game. I think they cheered louder than anyone else! Through rain and extra innings, the kids had a blast. We stayed the entire game and watched some incredible fireworks. We rolled out of the park about 11:00 pm and dragged the kids into bed around 11:30 pm. It was a great time and everyone wants to see another game soon. Thanks to Valerie for the free tickets!! I absolutely love Alabama football! Here’s the pregame video that they show in the stadium. It gives me chills. Roll Tide! !